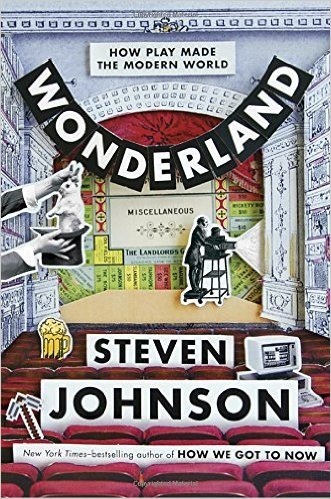 Wonderland: How Play Made the Modern World by Steven Johnson explores how our search for novel experiences and fun has driven many commercial and scientific aftershocks. The process of feeding our senses with pleasure lead to opening up world trade and it had the downside of feeding the slave trade and exploitation. The next time you think slacking off is a waste of time, you just might be in the process of innovation. This book is a history of what we do for fun and how having fun has had a great impact on everything else. One measure of human progress is how much recreational time we have, and the immensely varied ways we have of enjoying it. We see that innovation in one field often sets in motion transformations in other fields, and it’s experiences designed to delight or amaze that often end up transforming society in dramatic ways. Play is often about breaking rules and experimenting with new conventions. Is such, it is often the seedbed for innovations. While necessity may be the mother of invention, leisure and play are often involved as well. The pursuit of pleasure also stitches together a global fabric of shared culture. The quest for delight, however, has not always transformed things for the better. Start with the story of a purple die from a sea snail. In man’s quest to find more of these snails, the Phoenicians ventured beyond the Mediterranean and unlocked the Atlantic for all time. No one needs the color purple. It just looks nice. As soon as humans became tool makers, they started making jewelry. Since delightful things are valuable, they attract commercial speculation, which funds new technologies, markets, and geographical exploration. The human appetite for surprise, novelty, and beauty dominates in human cultures. As people in Europe developed a taste for fine clothing, cotton from the Americas came in demand. To meet this demand, the slave trade boomed and by 1860, half of population of southern states were slaves. Child labor abuse also resulted along with pollution from factories. This also lead to the creation of department stores in the late 1800s where people often went just to shop. Crime among women increased due to shop lifting. More women entered the work force and many were department store clerks. By the 1950s, malls were springing up. They exaggerated suburban sprawl and foreshadowed decline of the inner cities. This chapter ends with a plea to design and build new types of cities. This entry was posted on Monday, February 27th, 2017 at 7:44 am	and is filed under Book Summaries, Education Books. You can follow any responses to this entry through the RSS 2.0 feed. You can leave a response, or trackback from your own site.